It's quite complicated to avoid lace, isn't it? 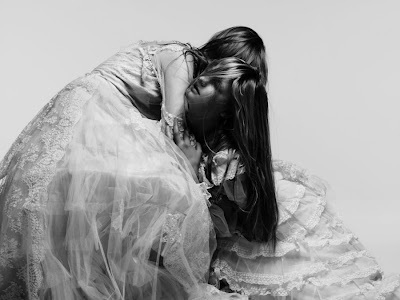 I found this epic photo (admitting you can call photos epic, hmm) on the Heidi Slimane fashion diary. The last time I blogged about it was about black and white photography. While I completely digg b&w photos, oh yes, the reason this particular photo draw my attention was because of the pose. One of the biggest quality of photos must be the ability to suggest movement. Because it is something contradictory to their state. I'm not sure I am actually expressing myself clearly, but such photos are inspiring. The two girls seem to have found themselves at the end of a battle. They seem exhausted by something. I wouldn't name them just sleepy... they seem to be falling off their feet. I love studying the posture of the bodies. Such states are hard to play in a satisfactory manner. To give the viewer the impression that you are in a real state like that... Combining all this acting with fashion items is quite a challenge. Maybe that's why fashion photography has so many different ways to express itself. This was my eye-candy for the day. Be good.